For locating parts or knowing what accessories will work with your machine, a manual can be very helpful. 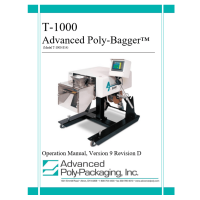 Advanced Poly offers downloadable manuals in our documents section. However, having a hard copy on site can be helpful. Each manual matches a specific serial number range, so be sure to have your serial number handy! If you are looking for parts or guidance on an option or accessory on your machine, please see our documents section where manuals for these are located. Advanced Poly continuously updates our technical manuals so they remain current with functionality enhancements, functionality changes, screen program changes and parts changes. However, sometimes there is a lag between the release of the technical data and shipment of the system causing incorrect information in the manuals. These changes may actually be present in later releases.It is our goal to continuously improve our technical documents and we offer free document downloads to all users. For an extra copy of the printed document there is a charge for printing and document preparation. To supplement manuals, Advanced Poly also offers Technical Assistance in our Help section where other “How-To” documents downloads are provided to assist your maintenance personnel.